Categories: Country Information and Resources, How to Adopt Internationally, About Adoption, How to Adopt, International Adoption. Adopting a child can be one of life’s most rewarding experiences. Unfortunately, complex policies, legal risks, and fewer available children can make a domestic adoption difficult. International adoption offers a solution to parents yearning for a child of their own.American parents are now adopting over 6,000 children a year from China and Korea. 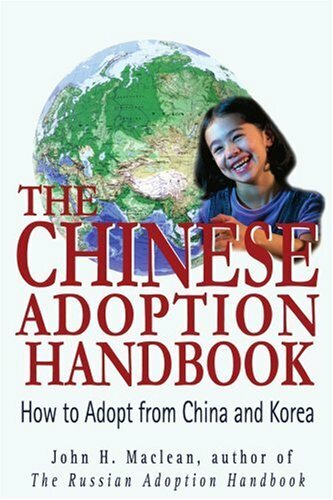 John Maclean’s The Chinese Adoption Handbook is a comprehensive guide to adopting a child from China and Korea.From pitfalls to practical advice, the rewards to the risks, The Chinese Adoption Handbook leads parents through the international maze, including:How the international adoption process works.How to start the process.What you need to know before traveling to China or Korea.Making the most out of your trip-the inside scoop on customs, hotels, and shopping.The children’s homes, the U.S. Consulate visit, and the questions that need to be asked.Medical issues, special adoption doctors, and travel requirements.Post-adoption procedures and much, much more.Practical, accurate, and written with a father’s sense of humor, The Chinese Adoption Handbook is the most comprehensive and up-to-date guide to adoption from China and Korea.